STAPLECROSS BONFIRE SOCIETY: A Jumble Sale is being held on Saturday June 9th - THAT’S TOMORROW! - at the Village Hall, Northiam Road, Staplecross. Doors will open at 2.00pm to allow entrance to all those clever people seeking all the fantastic bargains to be had. If you have any jumble and you’d like to donate it here, please drop it off at the village hall -on the day -from 9.30am. There will also be the usual tea/coffee available together with the popular Tombola & Cake stalls. For further information regarding this event and other amazing functions being planned by our own “Bonfire Boyz”, please contact Brian on 01580~830570 - John on 01580~830744 or Louise via email; louise_gardiner@btinternet.com who will all be pleased to tell you more of what they are planning for the rest of 2018. STAPLECROSS BOWLS CLUB: Continuing with their hectic fixture list, the team members of our own local outdoor bowls club have again four (4) matches to play this week. Only one of these will be an ‘at home’ match as the rest will be ‘away’’ games. Match no:1 is an ‘away’ game and will be played against “White Rock” team on Saturday June 9th. at an earlier time of 2.00pm. The following day Sunday June 10th the team will again be ‘away’ when their opponents hail from Hamstreet. this match will commence at 2.30pm and will form part of the Mermaid League. On Wednesday June 13th the Club teams will meet ‘The Observer’ team and will be the last of the ‘away’ games for this week. This game will also commence at 2.00pm. The only ‘home’ game will be played at the Club grounds on Northiam Road, Staplecross will take place on Thursday June 14th - their opponents will be from Winchelsea and this match -beginning at 2.30pm. will form part of the Rother Tournament. If possible, and you are in the vicinity, do go along and show your support for our village club. ROTHER RAMBLERS: Two walks are offered this week for our enjoyment, should we so wish and Walk No: 1 is arranged for Sunday June 10th and is a 10 mile circular walk exploring the countryside around Dungeness. The meeting point is the car park off the Lydd -- Dungeness road, - opposite the entrance to the Nature Reserve. OS.EXP 125. TR063197. (satnav TN29 9PN) at 10.00am. The walk notes state “This is quite a strenuous walk, as much of this will be on shingle (approx. 40%) the remainder being on normal footpaths or hard surfaces. The walk can easily be reduced for some members who may prefer to walk a shorter distance. The route explores this unique landscape and points of interest include Dungeness Nature Reserve; pre-radar Listening Mirrors; a Polish airman’s Memorial; Lighthouses and Coastline. Our 4 legged friends are welcome to accompany you, but must sometimes be kept on a leash. A picnic lunch is as usual suggested. Wil is to be your ‘walk leader’ for this excursion and you may contact him on: 01797~260417 or mobile: 07801~189747 for more details. 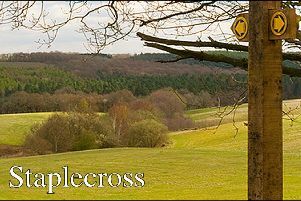 Walk No: 2 is planned for Tuesday June 12th and will be a 9 mile undulating circular walk with views. The meeting point will be at the Stonegate Village Hall. OS.EXP136. TQ667825. (satnav TN5 7ED) at the normal time of 10.00am. The walk notes state “Parking is available at the Stonegate Village Hall car park or on-road parking. Once more a picnic lunch is suggested. Carol will be your ‘walk leader’ for this meander and you can contact her on: 01580~852432 for all further information. EWHURST PARISH COUNCIL: Members of Ewhurst Parish Council, would like to invite you to come along to the regular monthly meeting of your local Parish Council. This meeting will take place on Thursday June 14th at 7.30pm and will be held this month in the Arthur Herdman Pavilion, Village Street, Ewhurst Green. This, like all council meetings, is open to the public, so please come along and have you say. Tell us about your concerns and talk to us about what you want to happen - or not happen - within our community. Put your questions to all levels of local government as representatives from Rother District Council and East Sussex County Council will hopefully, also be in attendance. We are always working hard on your behalf so please come and tell us how we’re doing, how we can improve, and how we can make living within this parish a happier and better place for us all. EWHURST, STAPLECROSS & BODIAM GARDEN SOCIETY-”ROSE SHOW” - Last reminder for this annual little local Flower Show which deserves a HUGE mention, if only to encourage more people to either pop along and enjoy a delightful afternoon treat or perhaps to entice a few to consider entering a class or two!. There are a surprising number of classes to choose from, - none of which are to be shied from !. and not all of the are just for roses. Schedules can be obtained from the local shop (Londis) in Staplecross. - If these have all been taken, then please ring either of the ‘Show Secretaries’ - Pam on: 01580~881839 or Maggie on 01580~830041 who will always be happy to help and guide you every step of the way. The date for this delightful horticultural show is Saturday June 16th - Staging is between 9.00am and 11.00am. after which the hall will be closed to allow for judging. This hall will re-open at 2.30pm to the public - and especially family, friends and other interested parties to come and admire the exhibits, see the results and offer congratulations (and commiserations also) to all the exhibitors. so please do come along and visit this show. STAPLECROSS VILLAGE HALL TRUSTEES would like to invite you to a “MYSTERY ARTEFACTS QUIZ” -- A Quiz Night Out - with a Difference”. Planned to take place on Friday JUNE 22nd. 7.30pm at the Village Hall, Northiam Road, Staplecross TN32 5QG. This will be no ordinary Quiz Night -- No normal ordinary questions- just intriguing teasers & testers using all of your senses whilst having a great fun filled evening !. Big brain power & high I.Q.’s are not needed - but THIS IS certainly a QUIZ WITH A DIFFERENCE as you’ll be making full use of ALL of your senses with mysterious and intriguing artefacts to TOUCH - HEAR - SEE - SMELL and even TASTE whilst working out the questions put before you. This promises to be a fun-filled and light hearted evening with a definite difference. So make a note of the date and book your place. Tickets cost just £8:00 per person to include a 2 course ‘Summer Supper’. Please bring along your own choice of alcoholic beverage, plus glasses. Why not get up a team or two for some friendly rivalry and team fun & banter ?. This evening will certainly have you saying “ WOW! - I never knew that !”. For all further information and to book your table please contact Anne on 01580~831881 or Pauline on 01590~831986. You certainly don’t want to miss this !. CHURCH SERVICES: CHURCH SERVICES for the parish of Ewhurst, will commence at St. James the Great, Ewhurst Green on Sunday June 10th Trinity 2. at 9.30am.This service will include Holy Communion. (BCP) A ‘Morning Praise’ service at St. Marks church, Northiam Road, Staplecross will follow directly after at 11.15 am. There will be NO SERVICE today at St. Giles church, Bodiam. If there is any church matter on which you feel you may need further assistance, especially Baptisms, Weddings and sadly, Funerals, then do please get in touch with our Priest in Charge, Canon Christopher Irvine on 01580~830925. He is always there to care and support you and unselfishly will guide you towards the solution that is right for you. DON’T FORGET: Please come along and support the Children’s Church Choir who will be singing Evensong at St. James, Ewhurst Green on Sunday June 10th at 5.00pm. ANY NEWS FOR THIS COLUMN - PLEASE CONTACT ME: However unreliable our weather may be, community life in and around our three villages is not reflected in any weather outlook, as many of our clubs, groups, societies and sports activities are planning lots of things to see, do and enjoy over the coming months. Whatever the nature of the event and however large or small, indoors or outside, then please get in touch. FREE coverage is available, via this column, courtesy of the Observer Newspaper. It’s never too early to send in any of the details and to tell us what you are planning. If it’s of interest to you - it’s of interest to us so please do contact me, as I’d love to hear from you and help ‘spread the word’ on your behalf.............Thank You.